Apple has held similar donation drives in the past, often providing prominent placement on its official website and within the iTunes Store and App Store on iPhones and iPads. The brutal Carr Fire has affected Shasta County, as well as the town of Redding, and is now ranked as the sixth most destructive fire in California's history. With California's dry weather, fires have become more common and have caused some serious damage. More than 125,000 acres and 1,500 homes have been destroyed or severely damaged so far, with six deaths blamed on the blaze. 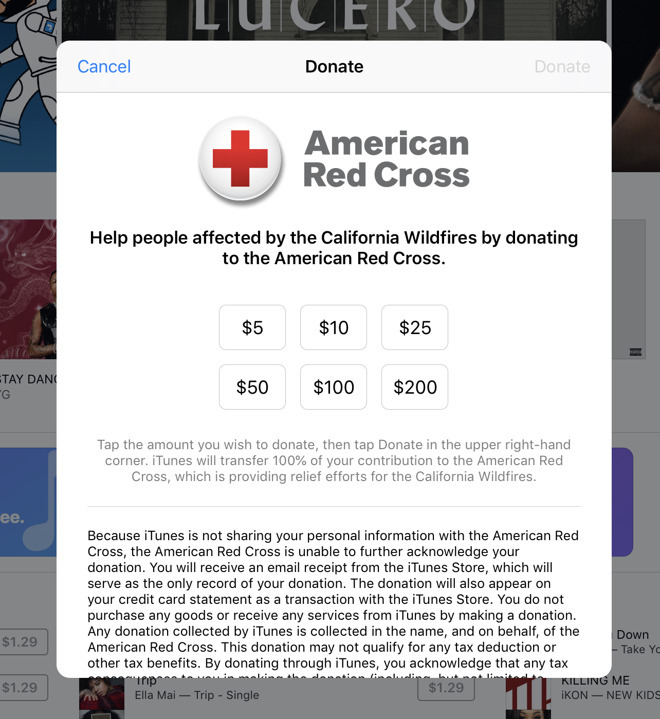 In the past, Apple has activated the iTunes donation mechanism for wildfires, floods, and other natural disasters. Those who wish to donate can do so directly the iTunes Store and App Store on their iPhone or iPad or can redcross.org.